The Lumina Project and Lighting Africa conducted a full-scale field test involving a switch from kerosene to solar-LED lighting for commercial broiler chicken production at an off-grid farm in Kenya. The test achieved lower operating costs, produced substantially more light, improved the working environment, and had no adverse effect on yields. A strategy using conventional solar-fluorescent lighting also achieved comparable yields, but entailed a six-fold higher capital cost and significantly higher recurring battery replacement costs. 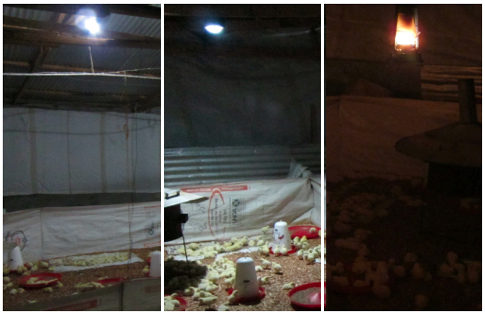 Thanks to higher energy and optical efficiencies, the LED system provided approximately twice the illumination to the chicken-production area and yet drew less than half the power. At the study farm, 3000 chickens were grown in each of three identical houses under kerosene, fluorescent, and LED lighting configurations. Under baseline conditions, a yearly expenditure of 1,200 USD is required to illuminate the three houses with kerosene. The LED system eliminates this fuel use and expense with a corresponding simple payback time of 1.5 years, while the solar-fluorescent system has a payback time of 9.3 years. The corresponding reduction in fuel expenditure in both cases represents a 15% increase in after-tax net income (revenues minus expenses) across the entire business operation. The differential cost-effectiveness between the LED and fluorescent systems would be substantially greater if the fluorescent system were upsized to provide the same light as the LED system. Providing light with the fluorescent or LED systems is also far more economical than connecting to the grid in this case. The estimated grid-connection cost at this facility is 1.7 million Kenya Schillings (approximately 21,250 USD), which is nearly six-times the cost of the fluorescent system and 35-times the cost of the LED system. The LED system also confers various non-energy benefits. The relative uniformity of LED lighting, compared to the fluorescent or kerosene lighting, reduced crowding which in turn created a less stressful environment for the chickens. The far higher levels of illumination also created a better environment for the workers, while eliminating the time required for obtaining fuel and maintaining kerosene lanterns. An additional advantage of the LED system relative to the solar fluorescent system was that the former does not require a skilled technician to carry out the installation. The portable LED system lighting layout is also more easily adjusted than that of the hardwired fluorescent systems. Furthermore, switching to the LED system avoids over one metric ton of carbon dioxide emissions per house on an annual basis compared to kerosene. There is high potential for replication of this particular LED lighting strategy in the developing world. In order to estimate the scale of kerosene use and the potential for savings, more information is needed on the numbers of chickens produced off-grid, as well as lighting uses for other categories of poultry production (egg layers, indigenous broilers). Our discovery that weight gain did not slow in the solar-fluorescent house after it experienced extended lighting outages beginning on day 14 of the 35-day study suggests that conventional farming practices in Kenyan broiler operations may call for more hours of lighting than is needed to achieve least-cost production. Lighting Africa, a joint IFC and World Bank program, seeks to accelerate the development of commercial off-grid lighting markets in Sub-Saharan Africa as part of the World Bank Group’s wider efforts to improve access to energy. Lighting Africa is helping mobilize the private sector to build sustainable markets to provide 2.5 million people with safe, affordable, and modern off-grid lighting by 2012. The longer-term goal is to eliminate market barriers for the private sector to reach 250 million people in Africa without electricity, and using fuel based lighting, by 2030. Improved lighting provides significant socio-economic, health and environmental benefits such as new income generation opportunities for small businesses. Lighting Africa contributes to the goals of the Clean Energy Ministerial. For more information, please visit http://www.lightingafrica.org. Lighting Africa is implemented in partnership with the Asia Sustainable and Alternative Energy Program (ASTAE), the Energy Sector Management Assistance Program (ESMAP), the Global Environment Facility (GEF), Good Energies Inc., Italy, Luxembourg, the Netherlands, Norway, the Public-Private Infrastructure Advisory Facility (PPIAF), the Renewable Energy and Energy Efficiency Partnership (REEEP) and the United States. Acknowledgments: We thank Josphat Karanu Muhuthu, Maina Mumbi, Arne Jacobson, Peter Alstone, Patrick Avato, Arthur Itotia Njagi, Benedicte Walter, and the 9000 birds that tolerated our presence over their 5-week stay in Maai Mahiu. This work was funded by The Rosenfeld Fund of the Blum Center for Developing Economies at the University of California, Berkeley, through the U.S. Department of Energy under Contract No. DE-AC02-05CH11231 and by the Lighting Africa Program.